Dorgon (Chinese: 多爾袞, duō ěr gǔn, 1612 - 1650) was the Prince empire of Qing Dynasty. His surname was Aisin Gioro. His reign names were Sing Cong and Chong De. 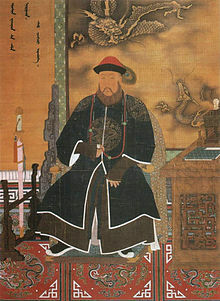 Dorgon was the 4th illegitimate son of Taizu Emperor (Nurhaci). Half brother of Huang Taiji, Half Uncle of Shunzhi Emperor. This page was last changed on 16 March 2013, at 12:07.